FinEngr Meets T. Boone Pickens! With a title like that, it’s hard to transition… Let’s just say Thursday turned out alright. During a charity event, I was leisurely flipping through an “original facebook” (i.e. the printed program of event attendees) to see if anything caught my eye. If only the last name was provided, I may have easily glanced over the entry. But low and behold, there he was, a few tables away. Once the idea sunk in, I got REALLY excited. Grabbing my fiance after dinner, we rushed over for an introduction. This was one chance I didn’t want to miss out on. FinEngr: “Yes sir”…stumble over words… try to make some intelligent comment relating to his interests in nuclear & wind energies. To tie everything together, there’s a little lesson related to personal finance here. Notice the underlined phrase: “whatever we do, we need to do it here”. Letting the idea regurgitate in my mind, I thought about the underlying theme (over a healthy glass of bourbon). Drawing out two, here’s what I took from it. One of the most limiting factors to growth can be relinquishing control and acquiescing to the controller. This process removes you from participating in your own future. Of course, there will be things which we may never control 100% or may have no choice in, but each time we choose to give away a little bit more it puts us at risk in the long term. One of the fears I’ve heard with improving solar’s technology has been losing control by not reinvesting in ourselves. If massive R&D projects are conducted, but not followed up on the manufacturing side – the future of the industry will be lost to elsewhere. It would be great for the manufacturing country, but not the research country because future developments will come from the back-end (reconfiguring and modifying the existing design). Sweet! Clean energy for the world! .-= Financial Samurai´s last blog ..Doing Anything You Can to Survive – Silence And Surprise In The Night =-. I’ll agree with the part about clean energy… we can debate the Cowboys. What I like is that he promotes all forms of energy production. It’s not between the “fossil fuel” and “clean energy” camps – it’s what’s best for everyone? And much like our investments, its not a sole-source solution – its a cocktail of different technologies. 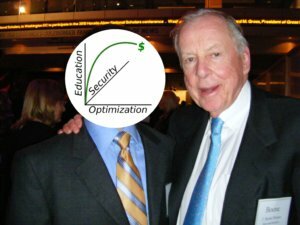 Mr. Pickens deserves some kudos for having the ambition to move away from oil. It certainly isn’t the easiest path for him to take, but I think it’s a just one. Stereotyping age with stubbornness, it’s also an incredible thing because it shows even though you can spend your whole life working in a specific area, when times/conditions change so can you. Thanks for stopping by! Seen LifeTuner around before, and interested in the services offered. Been by the site and it looks well done. That’s pretty cool meeting your “investing idol.” Did it go the way you hoped? I can only assume that you’re blowing up that picture and putting it over your bed or something. .-= Daniel´s last blog ..Free iPhone and 2 Months of Free Service =-. I’m not sure if anyone else is going to mention this… but you might want to go tanning a bit! Lol, but seriously, congrats, that’s pretty sweet that you got to meet him, awesome words of encouragement he had to say as well! .-= Ryan @ Planting Dollars´s last blog ..Three of the Best Blog Posts You’ll Ever Read =-. I’m hoping some of his idea electrons rubbed off on me.